I would like to start off by thanking everyone for all the positive responses! Also, when the CBSI gurus are discussing your article on the podcast, it means that I really have to step up my game every week! This week, I go back 1 year and look at a BRONZE AGE comic book (yes, not a modern variant pump and dump as some people like to call this). Today, the One Year Later Watcher looks at The Avengers #80, released in Sept 1970 featuring the very first appearance of RED WOLF. Yup, this book was abuzz a year ago with a new Red Wolf series coming out in the Fall of 2015; not to mention the very first appearance of Red Wolf was in 1970, so it has to be rare….right? The price of Avengers #80 a year ago for a very fine copy averaged 12 dollars. But after the new Red Wolf series was announced, the price shot upwards of 20+ dollars. New series, 35 year old book, first appearance…bronze age speculators (not modern pump and dumpers) were telling everyone that OLD books were the way to invest. Now, a full year later, the book is back at 12 dollars (if you're lucky) and the Red Wolf series has struggled so badly that it was cancelled after 6 issues, just enough for a single trade paperback. So what went wrong??? Looking after the fact, using a standard school grading of A+ to F, Red Wolf on his very best day is a D- character. Be weary of lame characters, nobody really cares for them. Be careful of these new TV shows like Shield, Flash, Supergirl, etc. that dig up crappy characters every week. These TV shows cannot use the A+ villains like Joker and Magneto so you get these unheard of villains that nobody cares about. How about the rarity of this book since it is a Bronze Age comic book, i.e. 35 years old? The average print run for the Avengers was 585,000 at the time. YES, you read that correctly. Marvel published over a 1/2 millions copies per month of Avengers in 1970…staggering to see that number when NOT a single comic book published in 2016 hit half of that for a regular monthly issue. Sorry, Bronze Age chest pumpers, this book is in every single decent back issue bin and is not rare at all. In conclusion, seeing how big the print run is and how poorly the new Red Wolf did (they even put him in a different time era), this would be a big NEGATIVE from the Watcher! 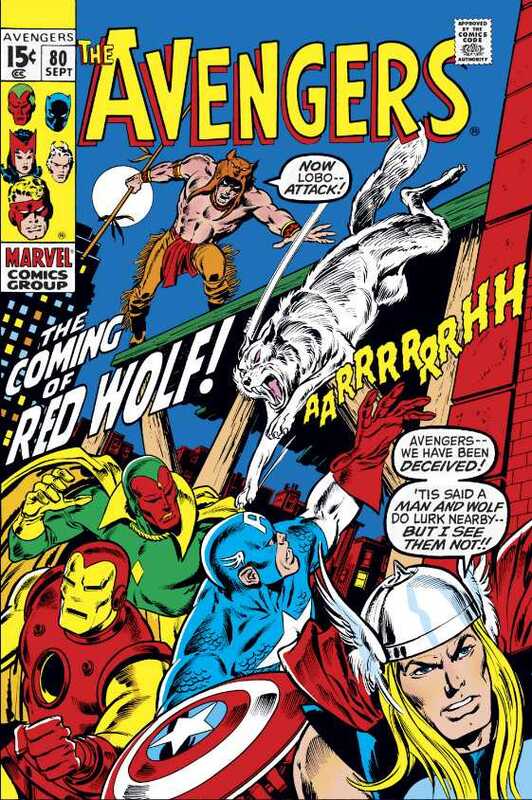 I didn't even mention that the original 1970 Red Wolf had a sidekick wolf called – LOBO! NO, not that Last Czarnian Lobo. Until next week, keep on watching! June 27, 2016 Dukes of Hazzard yanked off tv, all problems solved……right??? June 21, 2016 There's plenty of meat on that bone! Great article! It’s always fun to look back and see how comics performed. Loved this one. I almost spent way too much money on these last year. You asked what went wrong? Could have been a great character, but Marvel did the usual: they don’t invest and get behind characters that aren’t guaranteed wins. Instead, they just announce that this will be the next big thing and let it sink or swim with no life preserver. Marvel’s apathy toward characters in the comics that aren’t part of the current trends is astounding. Any character is only as good as the creators working on them. I say take Red Wolf and Lobo, put someone like Kieron Guillen and Andrea Sorentino (or however you spell their names), put him as an anti-hero sort of thorn in the Avengers’ side for the first arc until they realize he’s a good guy on a mission of vengeance, he joins the team. BAM! You’ve got a refurbished, gritty new Avenger, and he’s a Native American so you get the organic diversity that Marvel is so tritely trying to manufacture and push on us. But that’s just me. I like comics. Red Wolf? I mean, there’s the Black Panther, but that alludes to a movement which empowered a minority population. Calling American Indians “red” comes more from subjugation of a people and I think Disney has too many ears on the ground to touch that one. Maybe just buy the book because you like it… Red wolf isn’t going anywhere. Wyatt Wingfoot would probably be a prime candidate under different circumstances to force canonized ethnic diversity into the character dynamics of the MCU. It seems pretty clear that representing the Latino population is going to be the immediate priority, as they’re currently responsible for a large percentage of box office sales and difficult to find on screen.